Analysis of complex time-series data from ecological system study requires quantitative tools for objective description and classification. These tools must take into account largely ignored problems of bias in manual classification, autocorrelation, and noise. 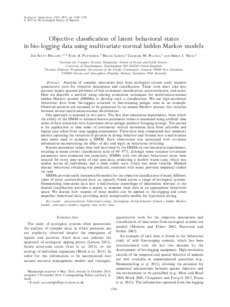 Here we describe a method using existing estimation techniques for multivariate-normal hidden Markov models (HMMs) to develop such a classification. We use high-resolution behavioral data from bio-loggers attached to free-roaming pelagic tuna as an example. Observed patterns are assumed to be generated by an unseen Markov process that switches between several multivariate-normal distributions. Our approach is assessed in two parts. The first uses simulation experiments, from which the ability of the HMM to estimate known parameter values is examined using artificial time series of data consistent with hypotheses about pelagic predator foraging ecology. The second is the application to time series of continuous vertical movement data from yellowfin and bigeye tuna taken from tuna tagging experiments. These data were compressed into summary metrics capturing the variation of patterns in diving behavior and formed into a multivariate time series used to estimate a HMM. Each observation was associated with covariate information incorporating the effect of day and night on behavioral switching. Known parameter values were well recovered by the HMMs in our simulation experiments, resulting in mean correct classification rates of 90–97%, although some variance–covariance parameters were estimated less accurately. HMMs with two distinct behavioral states were selected for every time series of real tuna data, predicting a shallow warm state, which was similar across all individuals, and a deep colder state, which was more variable. Marked diurnal behavioral switching was predicted, consistent with many previous empirical studies on tuna. HMMs provide easily interpretable models for the objective classification of many different types of noisy autocorrelated data, as typically found across a range of ecological systems. Summarizing time-series data into a multivariate assemblage of dimensions relevant to the desired classification provides a means to examine these data in an appropriate behavioral space. We discuss how outputs of these models can be applied to bio-logging and other imperfect behavioral data, providing easily interpretable models for hypothesis testing.